Few things entice me enough to make the three-hour trek from DC to NY on a Sunday. 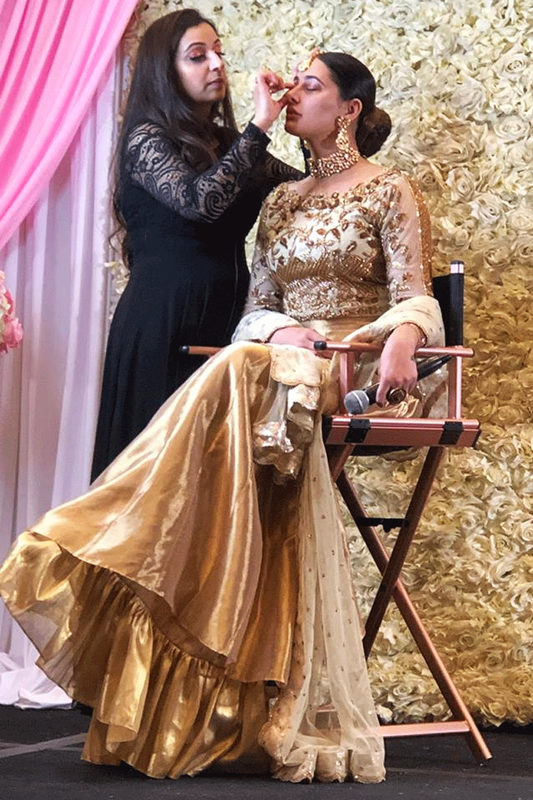 The chance to cover celebrity makeup artist Maliha Khan’s masterclass in New York City — one where she’d spill the tea on her pro tips with Bollywood actor Nargis Fakhri acting as her muse and all workshop proceeds would go to charity — is definitely enticing enough. Below are a few of my observations, takeaways and tips from the class. 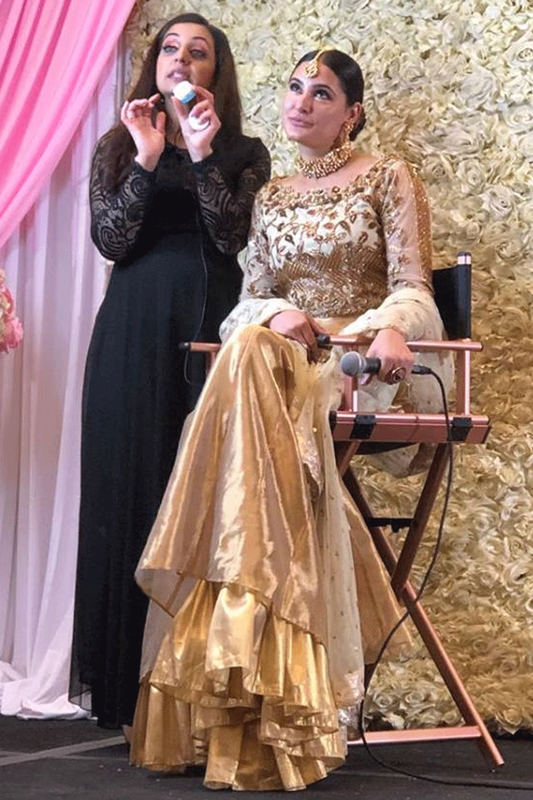 The event started with Nargis entering the venue sans makeup, decked out head-to-toe in bridal jewelry and a champagne gold Ansab Jahangir lehenga-choli. The look that Maliha was going to demonstrate was one we’ve come to associate with recent celebrity brides (think Deepika, Anushka, Priyanka, Urwa and Aiman Khan). Because of the amount of layering and setting that goes into this heavier, more evening-friendly look, I figured setting spray was going to be make an appearance. But I was still surprised when Maliha set Nargis’ look with setting spray not once but two different times during the class. The first time was right before we broke for lunch (non-makeup related pro-tip from my personal area of expertise: when in or around NYC, get you a chicken kathi roll). This first spritz was solely to lock in the blush and eye shadow that Maliha completed before doing Nargis’ foundation and lips. The second spritz, naturally, came at the very end when it was time to set the whole look. Watching the girly and kooky banter between these two best friends was a big part of why all the attendees seemed to be having so much fun (and also why things felt like a big yet intimate sleepover — the kind where a bunch of girlfriends get together and try makeup out on each other). When it came to helping us remember and understand her techniques, Maliha was a mean metaphor-spitting machine. How to blend a dark shadow in your crease line? Think of “windshield wipers”. Pairing two complementary eye shadow colors? “Marry the two”. And, as far as a good beauty hack goes, Maliha knows a thing (or ten) and isn’t shy to improvise and experiment with everything in her kit. For instance, while contouring Nargis’ nose (something Nargis claims to need and absolutely swears by), Maliha used a NARS Ita Kabuki Brush, which she lovingly refers to as her “chimta”. Later in the class, Maliha pulled out what looked to my untrained eye to be a perfectly medieval looking mini-spade. This medieval torture trap turned out to be a face mask applicator but, in a genius improvised move, Maliha used it instead to hold Nargis’ lashes at a totally steady, perfect angle to get a most exquisite mascara application. Readers please note that any and all chimtas and mini medieval makeup spades serving as your beauty tools should be used under adult supervision. Much like a bookworm thrives among her stacks of books, Maliha Khan, a self-confessed beauty product hoarder, lives and breathes makeup products. (Nargis Fakhri even suggested stopping by Maliha’s New Jersey studio and take whatever I want because chances are Maliha wouldn’t even notice). Turns out, Maliha is also the go-to girl for information on all beauty product discounts and sales. While contouring Nargis with a Benefit bronzer palette, Maliha confessed to having bought it (and every other palette on sale that day) at a coooool 75% off. Turns out, in the world of beauty, less is not always more. This beauty hack was actually my can’t-wait-to-try/favorite take away from the class because of how it brings together two of my favorite lewks: that natural, lit-from-within glow and a healthy, fresh-faced, natural looking blush. In a move Maliha described as “Photoshopping Nargis with her fingers”, putting on blush became an intricate, two-part process. 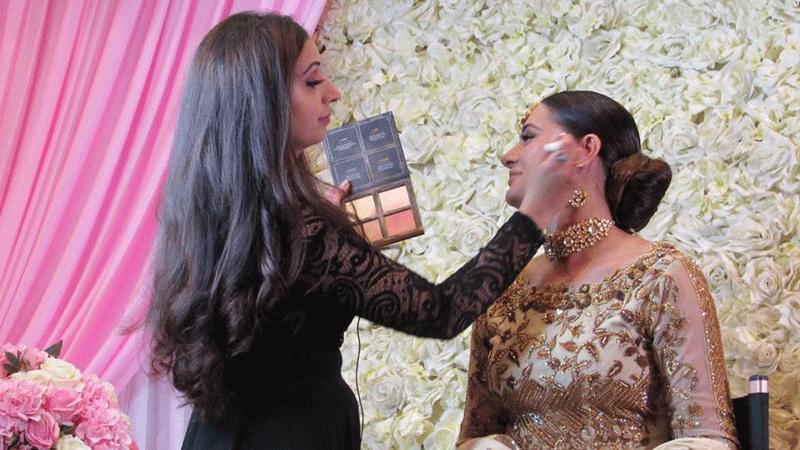 The first blush application came after Maliha finished with Nargis’ eye makeup and contouring. At this point, she applied Wander Beauty’s coral rose creme blush to Nargis and then – with a totally dry Beautyblender – she buffed and perfected this really natural looking blush (apparently coral/peach is not only really in, it works beautifully on the spectrum that is South Asian skin tones). And while most of us lay-folk, keeping in line with conventional beauty wisdom, wet our Beautyblender before working in the product, Maliha kept the sponge dry because, according to her, the creme blush is wet enough for the two to work together well. 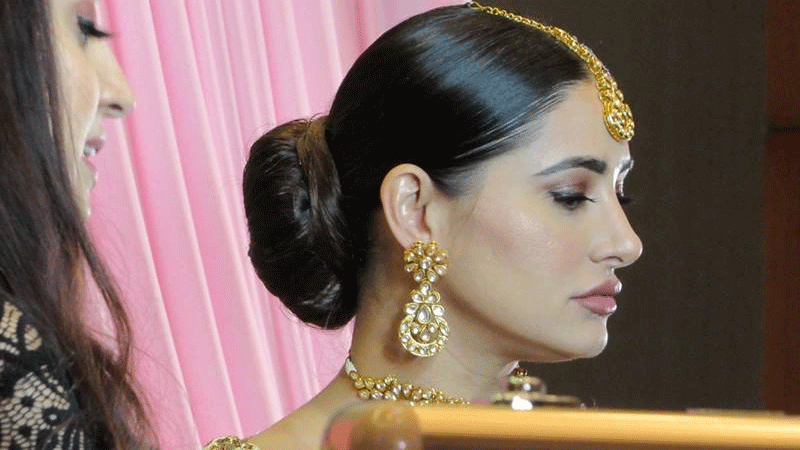 Maliha’s second blush application on Nargis’ perfectly sculpted cheekbones came after she’d done Nargis’ base. She went in with a blush brush and a highlighter palette (Yes, you’re reading this right… highlighter as blush, people). Using the shade Zimbabwe from the Huda Beauty highlighter palette, Maliha gave Nargis the most genius and “perfect onscreen glow”. Makeup is not just art, y’all. At the very least, it is also a soft science. Much like in the world of consent, in the world of makeup, age matters. One participant asked what to do about lips that tend to ‘bleed’ product due to the loss of collagen and volume as lips age. This wasn’t an issue that Nargis has but Maliha helpfully described how for her older clients she’ll completely “kill” the lip with concealer and then go back into redraw it. While trimming false lashes to get a better fit for Nargis’ eye shape, the women went back and forth on all the times they’ve seen the sad, droopy-eyed look because of a poor lash application. Maliha usually starts by pressing the lash against the center then moves to press the lash firmly on the inside then outside of the lash line. Nargis shuddered thinking of the years she spent in front of a camera before she started penciling in her brows. And, in line with the current trend of a big, bold and beautiful brow, both girls confess to loving and need a perfectly coiffed eyebrow (Nargis swears by microblading). We also covered the don’ts of the eyebrow world. According to the professional beauty duo, Genghis Khan-esque and Sharpie-drawn brows are both a hard no. Despite a room full of hundreds of women furiously taking notes with a formal stage setup, the whole thing had a very cozy, relaxed hanging-with-the-girls vibe. During the class, Nargis shared with us her recent struggle with weight gain (we heard it hours before she posted about it on Instagram which has since then gone onto become a hotly discussed Internet topic). Nargis also confessed to having aggressive hair growth – so much so that she has little eyelashes that grow in the corner of her inner eye (me too, Nargis! Me too!). When I asked what to do about this disconcertingly weird and unruly hair growth, Maliha admonished us to “just own it and work with it”. Got it. I am a proud OG Ansab Jahangir mehndi bride. And in the relatively short span of time since the brand has been around, it has skyrocketed in terms of really developing a unique brand style and ethos. 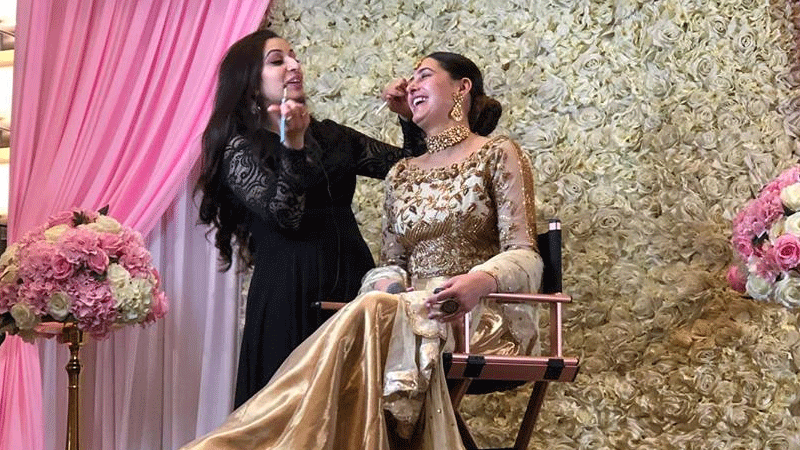 In fact, on the same day as our workshop, Ansab Jahangir dropped images from its latest campaign featuring none other than Nargis Fakhri who, according to Zoha (one half of Ansab Jahangir), epitomizes the Ansab Jahangir girl. Brands, influencers, celebrities… contrary to popular opinion, they don’t only care about the bottom-line. Many of these individuals not only want to do good but are conscious about using their platform to promote good. For mega-influencer Manal Sheikh it’s something as intimate and personal as wanting to show off a more positive, peaceful image of Pakistan to her over 2 million followers from around the world. For Ansab Jahangir it’s making sure their brand employs as many women as possible at all stages of their design and sales process because “if we don’t do it, who will?”. And for Maliha and Nargis it’s all about putting themselves dead-center in the dialogue of women supporting women, of walking the walk not just talking the talk. 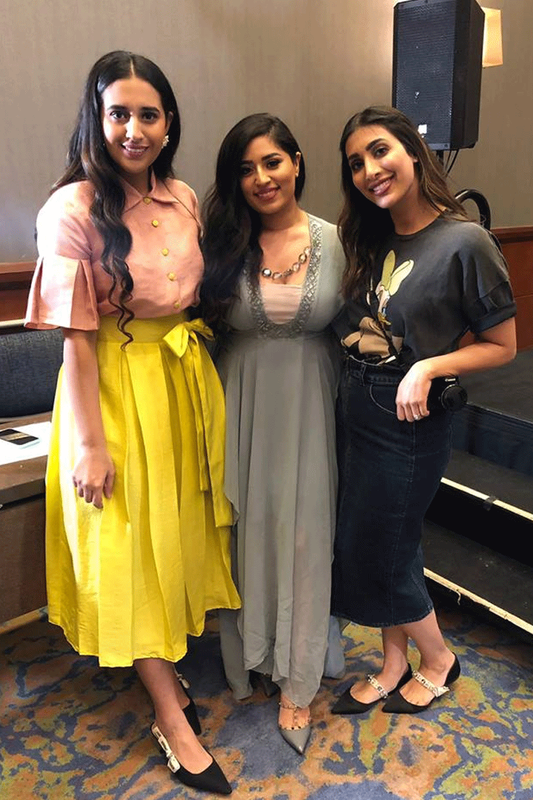 All of this came to life during the masterclass, which donated all its ticket sales to a charity supporting women and featured all female entrepreneurs as sponsors (handpicked by Maliha and Nargis).